Your mainframe investment and operations are critical to your company’s success in more ways than one. However, managing and maintaining your mainframe comes with a price and risks. How effectively can your mainframe adapt and respond to change and upgrades? Is your workforce positioned and readily able to adapt to mainframe upgrades, company acquisitions, or turnover? Has your mainframe’s obsolescence strategy been updated… or created? Is it time to migrate your mainframe platform to deliver greater firm-wide efficiency and customer value? Is your organization prepared for the decline of mainframe skill sets? 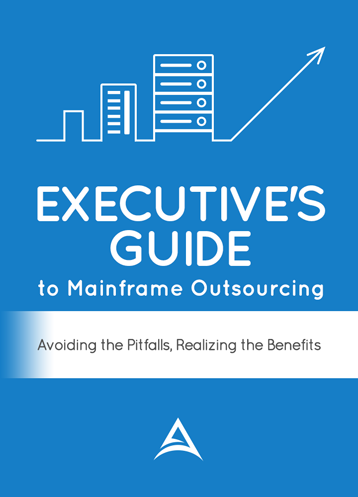 Do you know how much it would cost to outsource your mainframe? Do you know your mainframe’s total cost of ownership? Are you optimizing the value and effectiveness of your mainframe? When was the last time you performed a cost-benefit analysis to evaluate your mainframe’s cost-effectiveness and value? Outsourcing your IBM Mainframe environment could be a very profitable move for your organization. Our team of mainframe outsourcing consultants average 27 years of industry experience, and have worked in every segment of the industry. We’ll put together a detailed cost-benefit analysis of your mainframe operation, and if you find it to be financially justified, we provide support in selecting outsourcing vendors. Browse our outsourcing case studies and testimonials to learn how we can help your organization run your mainframe more profitably and efficiently, and alleviate problems with staffing, backup and outages.